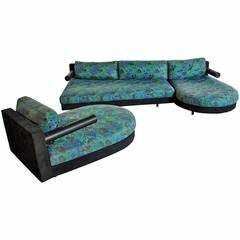 Original B&B Italia leather sectional sofa from the Maxalto collection. Model: Lucrezia, grey. This sofa consists of two sections. One straight and one chaise. Sits on die-cast aluminum Frame. Dimension smaller section: Depth 37.5 inches, length 90.0 inches, height 28.0 inches. Some indents on the arm rest. Some Corrosion to the die-cast aluminum. Can be polished out. B & B Lucrezia sectional sofa in leather. Modern round shagreen leather ottoman. Can be used as footstool or as a pouf. Hermes Dalvy. Calfs leather. 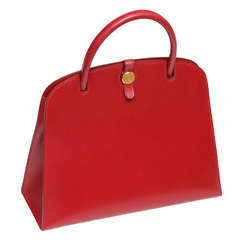 Rouge Hermes. Makers mark on the golden button, Hermes-Paris. Comes in the original box. This bag was just one time used. Measures: 30 cm. Original Gucci shotgun case in leather and brass. Comes with keys. The Interior is fitted with green fleece and leather bands. B&B Italia tufty time black leather sofa by Patricia Urquiola.